Liebherr and Karmsund Havn IKS have just signed a contract for a Liebherr LHM 550. 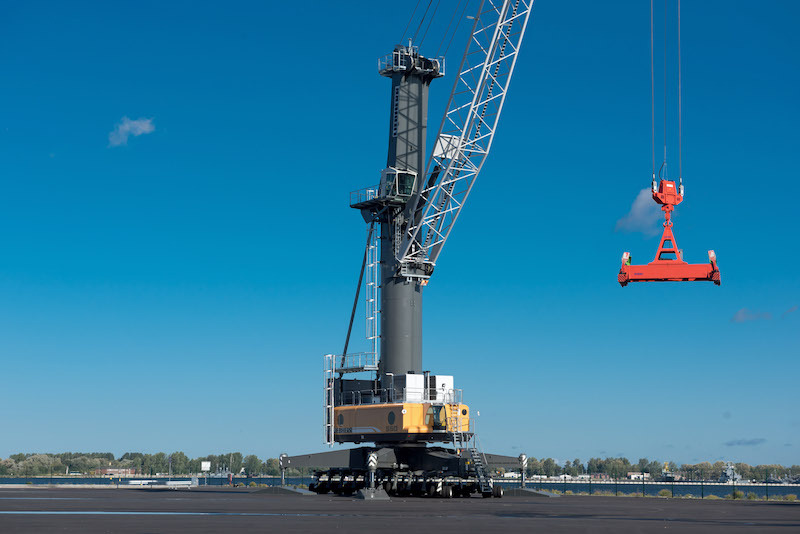 With a maximum lifting capacity of up to 154 tonnes and a maximum outreach of 54 metres, this crane will be the strongest mobile harbour crane in Norway. The crane can be operated with diesel or electric motors and will mainly be used for container handling. Karmsund Port Authority is one of Norway`s largest port areas with 13 million tonnes of goods and over 50,000 port calls each year. In January 2019, a new container terminal and a new ro-ro terminal will be opened at Haugesund Cargo Terminals, Husøy. This terminal will be an important logistics hub for the whole of western Norway and will be Norway’s most modern port terminal. To be prepared for the increased freight volume that the new terminal will bring, the port has decided to invest in a new crane. In the course of this forthcoming investment, Karmsund just signed a contract for a new Liebherr mobile harbour crane type LHM 550. Furthermore, the Karmsund Port Authority has an option for four additional cranes until 2023. "The new crane will become a prominent landmark in the region. The LHM 550 will be visible both from the air and from the sea when passing Husøy”, says Tore Gautesen, Port Director in Karmsund. “We chose a supplier with a great design and state-of-the- art technology. The most important parameters for our decision in favour of Liebherr were capacity, technical structure, manoeuvrability and an overall assessment of technology and environmental compatibility. The Liebherr crane met these requirements satisfactorily and Liebherr submitted the best bid in the tendering procedure". 54 metres, this crane will be the largest and strongest mobile harbour crane in Norway. The new machine will arrive by sea and will be completely assembled and ready for use when landing on Husøy. The new crane was sold with a Liebherr service contract. The entire service concept, which includes short response times and fast delivery of spare parts if required, had a positive influence on the decision. Together with the Liebherr service contract, which is based on Liebherr's market-leading service concept, this will ensure economic, stable and safe operation of the crane for the coming years.